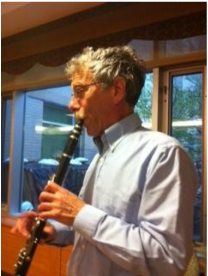 Peter wanted to play klezmer music after hearing CDs back in 1995. He chose the clarinet since it was a much-played melody instrument in this genre. Some years later, having heard about Haze Wainberg's welcoming community band, he joined and has been a member since, enjoying it greatly.His teenage musical career was as a guitarist with The Livewires, playing tunes by Elvis Presley, Beach Boys and other stars of the day. He has a doctor, now retired from family practice but still runs his travel medicine clinic.